Following hot-on-the-heels of our recent news about Apereo, The Xerte Project has been accepted as an affiliate member of the Open Source Initiative. "Xerte Project's Open Source Initiative membership furthers both organization's commitment to growing open source community and collaboration within institutions of higher education. July 15, 2015 - PALO ALTO, Calif. -- The Open Source Initiative® (OSI) has announced the Affiliate Membership of The Xerte Project, an initiative to provide high-quality free software to educators all over the world, and to build a global community of users and developers around the tools.The partnership highlights the OSI's continued efforts within the higher education sector...." Read the whole article here. Read more: Xerte accepted by OSI! The Xerte Project has reached a very significant milestone, having graduated from the Apereo Incubation process to become a fully-fledged Apereo project. 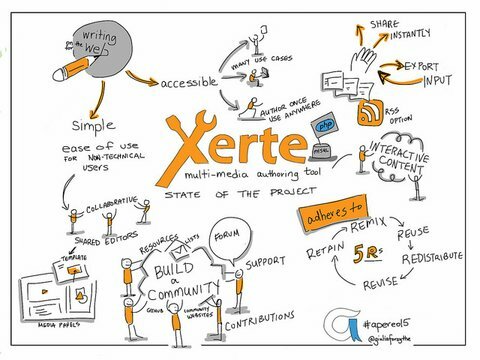 When I wrote to our user and developer communities about looking for a new home for The Xerte Project back in March 2014 we were uncertain where the road ahead would take us, although we had dismissed several options, and felt at the time that a foundation would offer the solution we were looking for.